Amanda Young is settled in Japan to conduct fieldwork this summer. The image above is from her blog, U Betula, where you can follow her adventures and research examining the treeline ecotone. We investigated relationships between tree-ring δ13C and growth, and flux tower estimates of gross primary productivity (GPP) at Harvard Forest from 1992 to 2010. Seasonal variations of derived photosynthetic isotope discrimination (Δ13C) and leaf intercellular CO2 concentration (c i ) showed significant increasing trends for the dominant deciduous and coniferous species. Δ13C was positively correlated to growing-season GPP and is primarily controlled by precipitation and soil moisture indicating that site conditions maintained high stomatal conductance under increasing atmospheric CO2 levels. Spatial language, such as route directions, can be analyzed to shed light on how humans communicate and conceptualize spatial knowledge. This article details a computational linguistic approach using route directions to study regional variations in spatial language. We developed a web-sourcing approach to collect human-generated route direction documents on a geographical scale. Guido Cervone makes an adjustment to the Total Sky Imager at the National Center for Atmospheric Research (NCAR) in Boulder, Co. Photo provided by Guido Cervone. 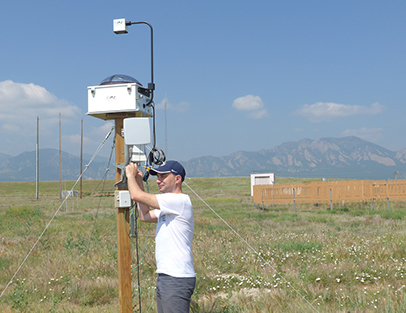 Cervone is testing the instruments as part of a research project to improve short term forecasts for solar power. Using a few of these instruments around solar farms should allow for a much better prediction of power generation, and in turn, make solar panels more efficient. Two members of the Human Factors in GIScience Lab (also GeoVISTA) will start tenure-track positions this fall. Rui Li, a former member of the Human Factors in GIScience Lab, will join the Department of Geography and Planning at the State University of New York at Albany (SUNY Albany) as an assistant professor and continuing his enthusiasm in research and teaching in GIScience, spatial cognition, and wayfinding. Before joining SUNY Albany, Rui worked as a postdoctoral researcher and substitute professor in the Institute for Geoinformatics at the University of Muenster in Germany. He received his doctoral degree at Penn State in summer 2012. Raechel Bianchetti (Ph.D. ‘14) has accepted a tenure-track position at Michigan State University. She will be joining them as an assistant professor in the Department of Geography where she will be teaching cartography and continuing her research concerning human factors of remote sensing image analysis. If you visit the second and third floors of Walker Building this summer, watch out for boxes, furniture, books, and lots of recycling. To better integrate the two floors housing the department, many office moves are underway. Changes on the second floor: Rob Crane and Neil Brown to 201, Alan Taylor to 202, Lorraine Dowler to 203, Rob Brooks to 220. Justine Blanford and Scott Pezanowski move into west-side offices 213 and 211, respectively. As various lab/center spaces rearrange, the seminar room (203) moves to 225 (was LEAPS). Changes on the third floor: Post docs and lecturers move to 315 and 316. Clio Andris will be in 317. Anthony Robinson to 318, Erica Smithwick to 323, Karl Zimmerer to 309. Cindy Brewer will stay in her current office (325) next to the main office. Among staff, Angela Rogers will move to 302B (in the main office) and Marnie Deibler (with research records) will move into 301A (was the head’s office). These moves proceed through July into August. Denise Kloehr, Barbara Luther, and Bob Hibbert are keeping track of the sequences and workers. Penn State University has announced the creation of a Master of Professional Studies (MPS) degree in Geodesign, with applications now being accepted. The MPS in Geodesign is offered exclusively online through the Penn State World Campus and is intended for professionals who are able to participate principally on a part-time basis and at a distance. The program’s goal is to provide practicing professionals with an advanced skill set in geodesign. The Department of Landscape Architecture and the Stuckeman School of Architecture and Landscape Architecture in partnership with the College of Arts and Architecture’s e-Learning Institute have developed the program and the courses. 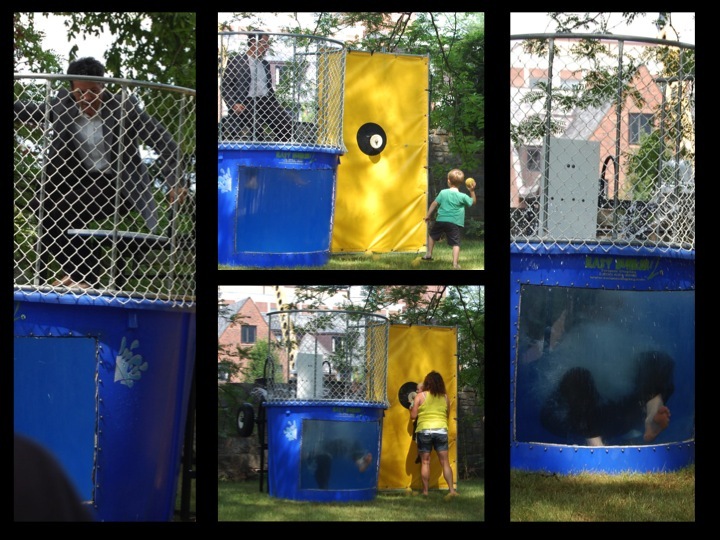 Tim Robinson gets dunked by child at 2013 carnival (with a little help). The 2014 EMS Ice Cream Social will be held on Wednesday July 16 from 2:00– 4:00 p.m. at the Earth-Engineering Sciences Building. (Since the construction at Walker Building will not be completed in time, we moved the location to the Earth-Engineering Sciences Building.) But, as always, there will be FREE Penn State Creamery ice cream, and we will also have the dunk tank, which is very popular. The Staff Advisory Committee will be selling Pepsi products and water. 3:20 – 3:40 mystery person! We will be accepting donations for both the ice cream and the dunk tank, so bring your wallets! All donations will be deposited to the EMS Staff Centennial Fund, which provides monies to support staff in the completion of educational and professional development courses. We also will have order forms available for our “EMS Cooks” cookbook—also to support the Staff Centennial Fund. You can order your cookbook on line anytime. Please post the Ice Cream Social flyers in your departments and order your cookbooks today! SAC hopes to see you at the Earth-Engineering Sciences Building onWednesday, July 16! 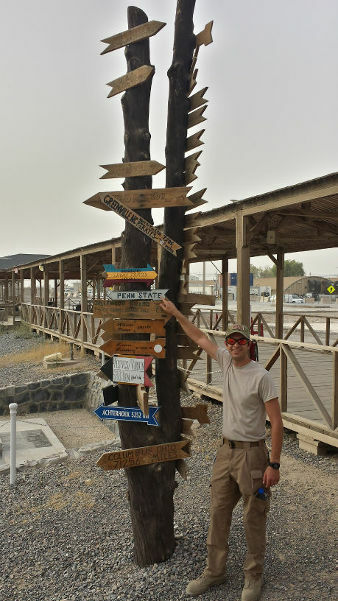 Justin Novak (supervised by Guido Cervone for his online MGIS 596A class) is currently in an undisclosed location of Afghanistan. Even though Novak cannot say precisely where he is, he can point the bearing to Penn State! Jennifer Balch and her husband Curtis Runyan announced the birth of their first child, Cody Jasper Runyan, on June 23, 2014. After a scrubbed launch attempt on July 1, NASA successfully launched the Orbiting Carbon Observatory (OCO-2) early in the morning of July 2. This new science satellite will provide a global picture of human and natural sources of carbon dioxide, and will also help to quantify carbon dioxide sinks—places on Earth that naturally pull carbon dioxide out of the atmosphere. Currently, less than half the carbon dioxide (CO2) emitted into Earth’s atmosphere by human activities stays there. Some of the extra carbon dioxide is absorbed by Earth’s oceans. Natural land sinks take up the rest, but the amounts taken up at various locations on the Earth’s surface are not well understood. The latest addition to The Arboretum at Penn State opened to the public on Monday, July 7 — the Childhood’s Gate Children’s Garden. A garden for children and anyone who is young at heart, Childhood’s Gate is a unique space for exploring nature, fostering wonder and celebrating the plants, animals and geography of central Pennsylvania. Should world maps be redrawn? Maps are always changing. A new nation is added. Old lines cease to make sense. Turf is claimed and reclaimed.What parts of the world should rethink their maps? Why and how? 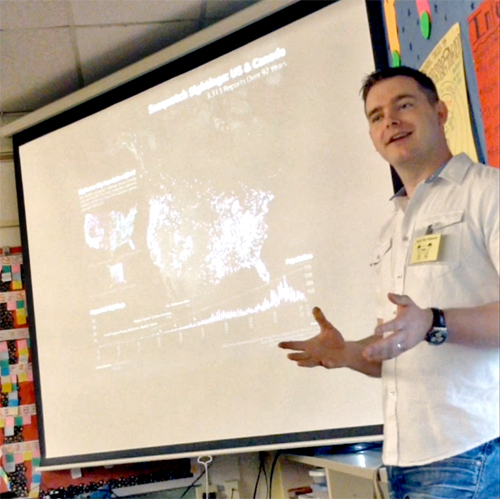 Joshua Stevens was invited to give the presentation for the Geo Club at Radio Park Elementary School in May 2014. Students were given an overview of what cartography is, what cartographers do, and how art and science are important to map makers. The students were shown examples of thematic and reference maps, in addition to some map facts that had them questioning the maps they encounter. Afterwards, students spent time asking some really great questions (“How do we really know where one country ends and another begins?” “Why are map symbols always so small?” “If I’m an artist, can I make maps?”). Of all the maps students were shown, the classroom favorite was a map of the amount of snowfall required for school to be cancelled. • Courtney Jackson was selected to receive a Pennsylvania Space Grant Consortium Undergraduate Scholarship. • Alex Klippel and his wife Melina announced the birth of their second child, Feliks Julius Peter Czymoniewicz Klippel, on June 18, 2014. How is Buruli Ulcer spread? PI Petra Tschakert, co-PI Erica Smithwick, and Vincent Ricciardi (M.S. ‘14) are investigating strong links between land disturbance and transmission of the disease. See the video on the department home page. Penn State’s Sustainability Institute, in conjunction with the Student Sustainability Advisory Council (SSAC), dedicated a dogwood in the Leadership Tree Award grove in memory of former Penn State student Jon Taiclet. Taiclet, a 21-year-old geography honors student and sustainability leader, passed away in 2006 during his tenure as a student at Penn State. The potential impact of climate warming on patterns of malaria transmission has been the subject of keen scientific and policy debate. Standard climate models (GCMs) characterize climate change at relatively coarse spatial and temporal scales. However, malaria parasites and the mosquito vectors respond to diurnal variations in conditions at very local scales. Here we bridge this gap by downscaling a series of GCMs to provide high-resolution temperature data for four different sites and show that although outputs from both the GCM and the downscaled models predict diverse but qualitatively similar effects of warming on the potential for adult mosquitoes to transmit malaria, the predicted magnitude of change differs markedly between the different model approaches. This chapter discusses how livelihoods, poverty and the lives of poor people, and inequality interact with climate change, climate variability, and extreme events in multifaceted and cross-scalar ways. It examines how current impacts of climate change, projected impacts up until 2100, and responses to climate change affect livelihoods and poverty. The Fourth Assessment Report stated that socially and economically disadvantaged and marginalized people are disproportionally affected by climate change. However, no comprehensive review of climate change, poverty, and livelihoods has been undertaken to date by the IPCC. This chapter addresses this gap, presenting evidence of the dynamic interactions between these three principal factors. At the same time, the chapter recognizes that climate change is rarely the only factor that affects livelihood trajectories and poverty dynamics; climate change interacts with a multitude of non-climatic factors, which makes detection and attribution challenging. Related: See Petra Tschakert’s Coffee Hour talk on this experience. We are currently taking orders for the EMS Cooks cookbook, which can be ordered online at: http://www.geog.psu.edu/cookbook-order-form. Over the past few months, the EMS Staff Advisory Committee collected recipes for a cookbook to raise money for the EMS Staff Centennial Fund and many of you sent in recipes in support of this work. Thanks to generous cooks throughout the college, we have over 120 recipes, including vegetarian and gluten-free. The cost of the cookbook is $12 for one, or $10 each for 2 or more, plus postage (if needed).